Because I write book reviews for the books I read, I have to keep track of what I think as I am reading. Of course I make notes about what I think are the good and bad. But the most useful thing I do is keep track of my general feeling for a book on a little sliding scale that I made. 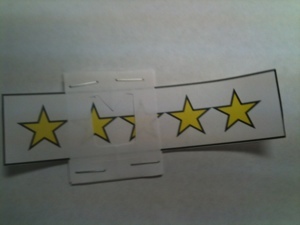 It’s just a piece of paper with 5 stars on it and a slider that I can move quickly and easily. For example, this slider currently depicts my overall feeling for Flank Hawk by Terry W. Ervin II, which I am currently reading. It’s such a simple little thing. But it is just so gosh darn useful.